Shut Up About Human Rights! Ten nations deny access to LGBT rights groups. 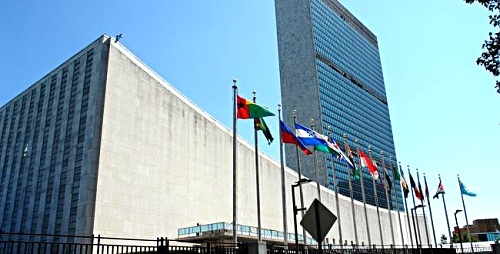 The United Nations allows about 3000 groups to come before it and speak on subjects of concern. These groups include the International Red Cross, for example. Which groups can be heard by the Economic and Social Council (ECOSOC) is controlled by the NGO (Non-Governmental Organizations) committee. 18 nations are on this committee, including the United States. Last week, ten of these nations voted to refuse access to two gay rights groups: the Brussels-based International Lesbian and Gay Association and the Danish gay rights group Landsforeningen for Bosser og Lesbiske. These groups wished to inform the United Nations of human rights violations being perpetrated on gay and lesbian citizens. Thanks to the NGO committee, the United Nations can pretend such violations do not exist by the simple expedient of not hearing about them. Who voted against providing a forum for these groups? Iran did, of course. These are the wonderful folks who execute gay men simply for being homosexual. This homophobic attitude has not been changed since the US invasion. In fact, the vote was on Iran's initiative. Human rights violators Sudan, China, Iran, and Zimbabwe also voted to ignore gay rights issues—hardly a surprise. Here's the surprise: the United States aligned itself with these human rights violators. That's right, a country that once prided itself on being the champion of human rights and free speech has now publicly abdicated this position in view of the world. Last Friday, Washington state voted in protections against its gay and lesbian citizens, joining the 16 other states that have done so. That makes nearly half the US population that is thus protected, that have requested such protection. Yet, in another show of disinterest in the wishes of the American people, the Bush Administration has ignored this fact and put its own will above that of the people it supposedly represents. "This vote is an aggressive assault by the U.S. government on the right of sexual minorities to be heard,'' said Scott Long, director of the Human Rights Watch (HRW) program for lesbian, gay, bisexual, and transgender (LGBT) people. "It is astonishing that the Bush administration would align itself with Sudan, China, Iran, and Zimbabwe in a coalition of the homophobic," Long said. I wish it was astonishing. Unfortunately, it's just business as usual for King George II.